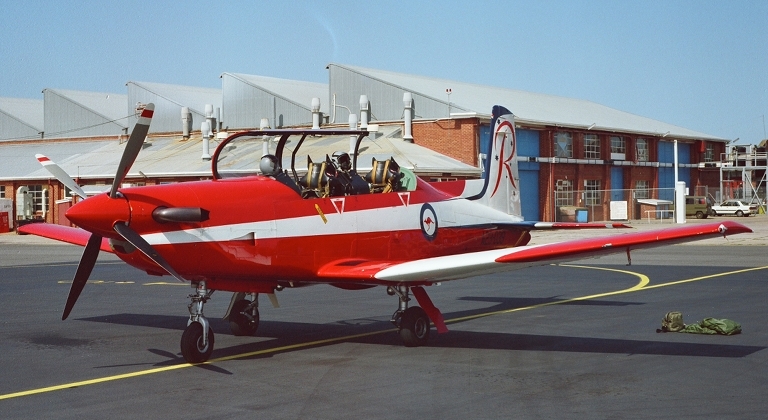 RAAF Pilatus PC-9/A assigned to Central Flying School at RAAF Laverton (© 1991 - 2010 Carlo Kopp, M645/1000S). 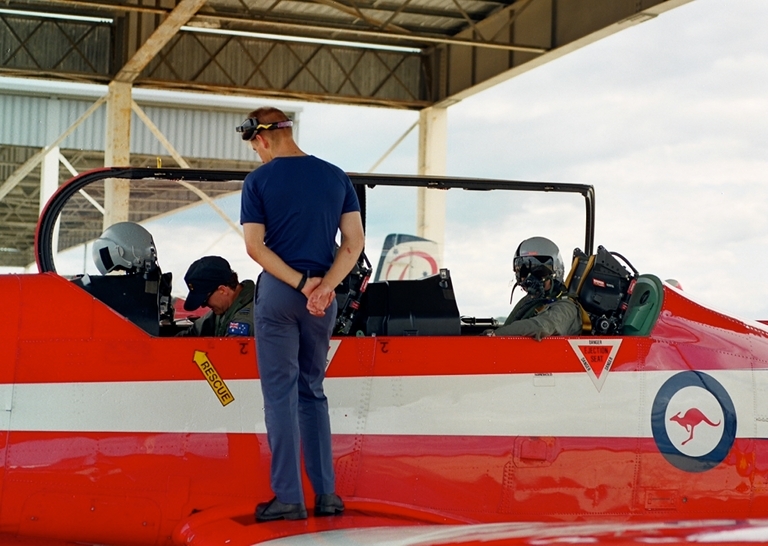 The PC-9 is the RAAF's new basic-to-advanced trainer, which will be used for ab initio to advanced training for all RAAF pilots, fast jet pilots then transitioning to the Macchi MB-326 (since this was written the RAAF has signed for the BAe Hawk) and then the F/A-18A or F-111A/C. The author had the pleasure to fly the PC-9 recently and the aircraft clearly lives up to its reputation for superb handling and performance. 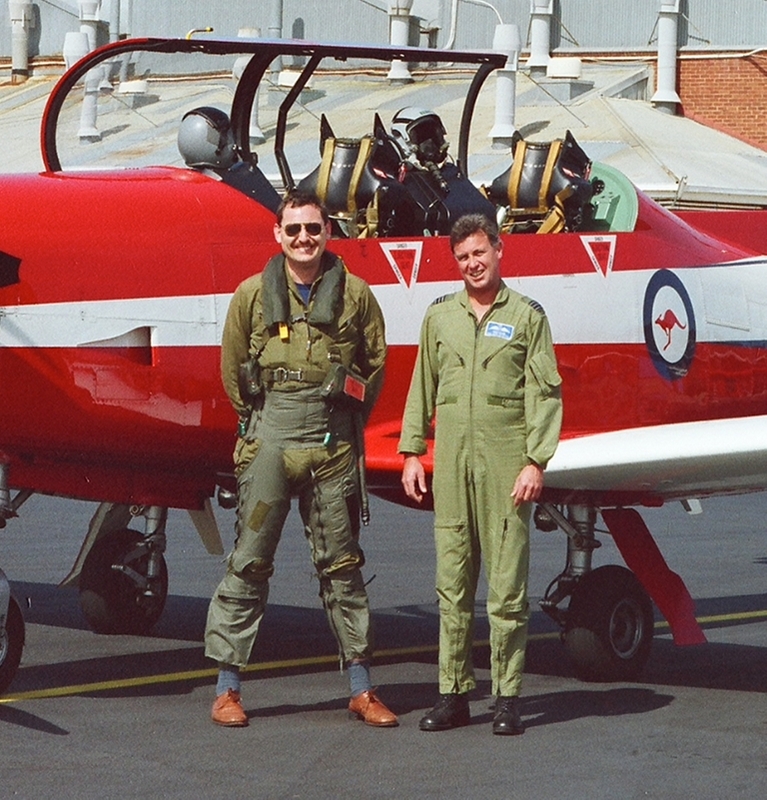 The author flew in aircraft A23-039 in Roulettes livery, callsign Alladin 404, the command pilot was Wg Cdr Frank Atkins, formerly an F-111 aerobatic display pilot and currently assigned to the staff of Training Command HQ at Point Cook. Preparation for the flight involved helmet and G-suit fitting, the latter a most interesting procedure which typically takes a quarter of an hour, during which time a life support fitter will undo all of the laces in the suit, and adjust the waist, thighs and calves for a suitable fit. 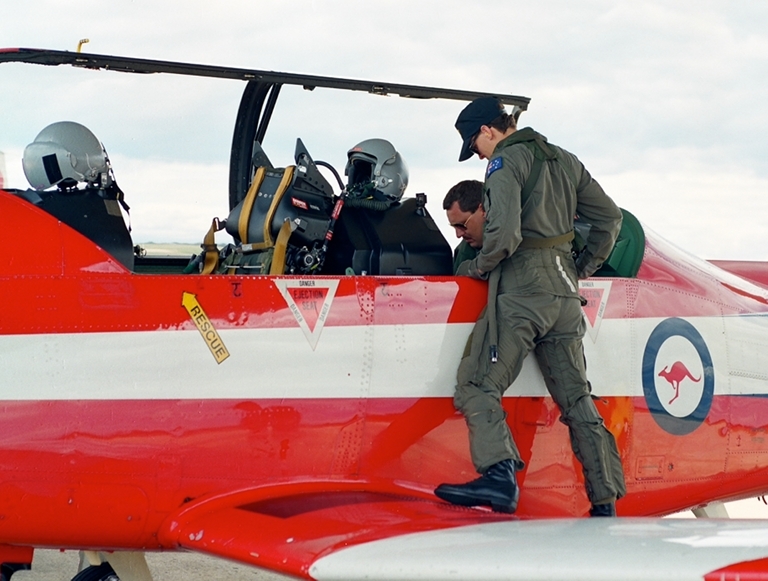 Preflight checks for aircrew also include a series of checks on the Martin Baker MK AU11A ejection seat, which requires the removal and stowage of a range of pins. Once the crew is seated, the seat heights must be adjusted with the servo switch on the RHS of the seat, the G-suit hose must be connected to its high pressure air feed to the left of the seat, and the oxygen hose and intercom lead must be plugged in. The cockpit layout is much like that of a modern fighter, but is simpler due the absence of a HUD and offensive, defensive and weapon control panels and displays. The Power Control Level (PCL) is situated to the left, with a rocker switch for rudder trim on the lower front of the handle, while the fighter style control stick is conventionally located with pitch/roll trim via a 'coolie hat' switch at the top. The pedals are large, comfortable and well positioned. The gear select and indicators are situated at the junction of the left console and control panel, the console also mounts the 3 position flap selector, trim system controls, anti-ice, emergency fuel controls and a breaker panel. The right console is occupied with electrical system controls, lighting controls, attitude/heading reference system (AHRS), environmental control system, engine starter and oxygen regulator controls, with another breaker panel to the aft of the console. The engine instruments are to the upper right of the instrument panel, with analogue displays for engine torque, turbine inlet temperature, RPM, supplemented by displays for oil temperature/pressure and fuel contents. In addition, digital readouts of fuel remaining, fuel used and fuel flow are displayed, together with hydraulic accumulator pressure. The centre of the panel is occupied by the two MultiFunction Displays of the Bendix EFIS. The upper MFD displays the ADI(Attitude & Direction Indicator), with AoA ladder and roll angle symbology, compass heading and ILS glideslope when selected, while the lower is a HSI (Horizontal Situation Indicator) display which provides a DG rosette, ADF, VOR and Tacan displays in its various modes. A standby conventional ADI (AH) is situated to the left of the panel. Basic flight instrument displays are conventional, with an altimeter to the right of the MFDs, and a VSI beneath it, and an ASI to the left, beneath which is a conventional ADF display. The G-meter is conveniently to the left of the ASI. The lower part of the panel left to right mounts a conventional clock, emergency gear release handle, comm1, comm2, EFIS controls, a Nav/Tacan, ADF and transponder display, the parking brake and to the lower right, a master warning telltale panel. The bubble canopy is side hinged and provides outstanding visibility from both seats, more typical for a fighter than a trainer. The absence of windshield framing provides excellent forward visibility to either side and the elevation of the seats further enhances the effect. 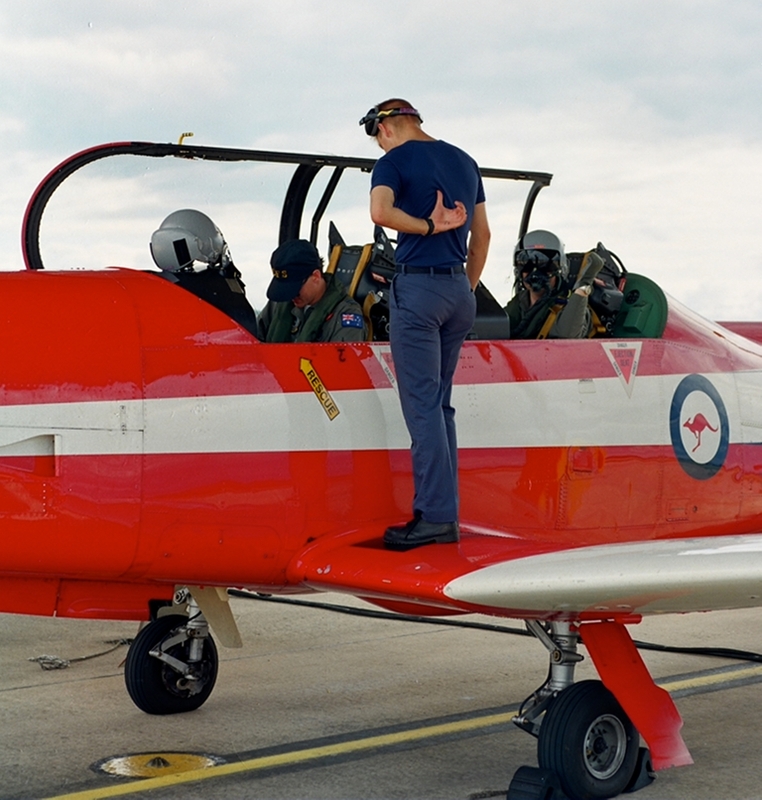 Above, below: author receiving a pre-flight cockpit brief prior to a 1994 sortie in a RAAF Pilatus PC-9/A assigned to Central Flying School at RAAF East Sale (© 2009 - 2010 Carlo Kopp, Mamiya M645/1000S). The flight took place from RAAF Laverton early in the afternoon, with 2/8 at about 2,500 and light wind providing close to optimal conditions for a mixed aerobatic and circuits session. After strapping in and shutting the canopy, Frank started the aircraft, carried out the required checks and radio calls and taxied to the holding point for R/W 23, prior to taxi the seats were armed by removing the master arm T pin, which each crewmember stows in a receptacle on the canopy frame. I was given a brief on the ejection procedure in the event of an engine failure during takeoff, after which we lined up and I was given the aircraft for takeoff. PCL to 40 psi torque, the aircraft accelerated very rapidly, at which point I was told to advance the PCL through the gate to max power. I was late with my bootful of right rudder, drifted off the centreline but subsequently corrected and rotated the aircraft gently at 80 KIAS. At climb attitude the aircraft accelerated very quickly to 130 KIAS, with gear up I climbed out tracking over Werribee to R314C/D310 over the peninsula to the South. The aircraft climbs very rapidly and requires very little stick force to maintain proper attitude, little pitch trim was required but considerable rudder trim was needed with any change in PCL setting. We levelled off at 6,000 ft and very shortly arrived over our objective. My initial impression was very favourable, as the aircraft has very light and responsive controls yet is very stable and feels very predictable. Rolling out of turns, it has no detectable undershoot or overshoot, this perception was further reinforced throughout the flight. We commenced the handling demonstration with a power off stall. PCL to idle and increasing backstick, the aircraft feels very stable until just prior to the onset of the stall, where the effectiveness of the controls begins to suffer. The stall occurs clean at 75 KIAS and is evident from slight buffet. Stall recovery is conventional, with sufficient forward stick to unstall the wing while the PCL is advanced to full power. Beware those late with rudder, when the PT-6 bites, it bites, the acceleration is very rapid and again generous right pedal is required until the rudder is trimmed. The rudder trim on the PCL is well located and comfortable to use, although my opinion is that gearing it a bit faster wouldn't hurt. The next step involved basic aerobatic manoeuvres and steep turns. Basic manoeuvres are entered at 200 kt level, combination manoeuvres require a slightly higher entry speed of 250 kt. The aileron roll is very easy, the aircraft attaining its full roll rate very quickly with very little stick force required and no alternating rudder input. The nose sits on the horizon and recovery to level flight is achieved cleanly with no perceptible undershoot or overshoot. The low moment of inertia in the roll axis and effective aileron yield a very high instantaneous roll rate, with the high sustained rate and superb control damping providing for a neat and fast roll with very little practice. The loop is also flown very easily, with very slight stick force required to maintain 4.0 G in the first phase of the manoeuvre. Directional control through the pullup and over the top is excellent with very little aileron required to maintain wings level, throughout the manoeuvre the aircraft feels stable and smooth. The pitch response throughout is sufficiently sensitive to provide for a very precise manoeuvre with a minimum of stick force. Similarly, the stall turn benefits from the superb handling of the aircraft, with slight forward stick and generous aileron over the top, the aircraft is well behaved through the central phase of the manoeuvre and requires little opposite rudder to arrest the yaw rate into the nose down attitude. The nose down attitude is held shortly for the engine to stabilise, while it belches blue smoke from its exhausts, and recovery from the dive is easy and smooth. The PC-9 is a superb aerobatic platform and will perform well with far less effort than is required to cleanly manoeuvre typical GA aerobatic trainers. The responsiveness and excellent control damping allow precise control of the aircraft with little control force and the superb visibility provides for easy orientation throughout the manoeuvre. There is no excuse for poor aerobatic flying in the PC-9. The PC-9 enters a steep turn smoothly and again only slight back stick is required to hold the nose rock steady on the horizon, while maintaining a constant turn rate, again recovery is smooth with no observable overshoot or undershoot. At this point in the flight I found that the G-suit was getting the better of me, being accustomed to 3.5-4 G without a suit I found that getting crushed at 1.5 G or so and thereafter made me very uncomfortable. Bonedomes, G-suits, overalls and Mae Wests (correctly the Secumar life preserving vest) take some getting used to (a note of warning to those GA pilots seeking a fast jet career !). Disconnecting the G-suit made a real difference, so I continued on with some turns before returning to Laverton for circuits. 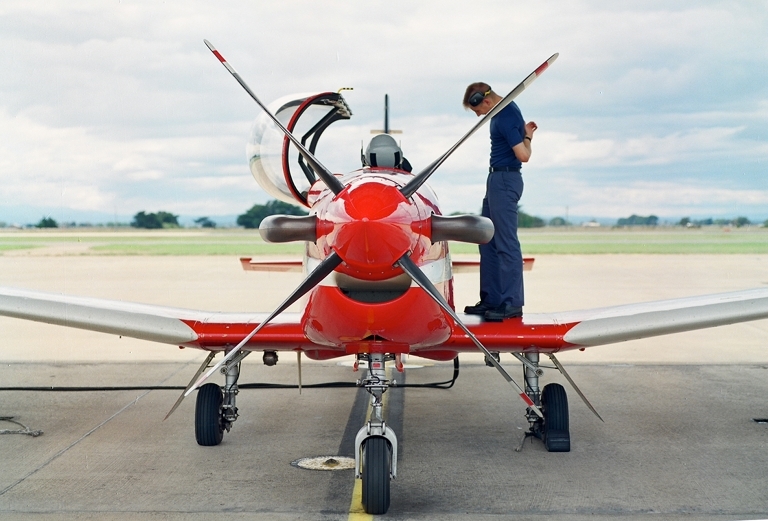 The PC-9 is a sheer pleasure to fly, be it aerobatics or simply general handling . The controls are light, responsive and perfectly damped, but retain a measure of the firmness which is preferred in military trainers. Even beginners will find that the aircraft inspires confidence very quickly and always feels very predictable and stable. Enroute back to the Laverton circuit Frank demonstrated the various modes of the EFIS. The MFDs are full colour CRT units which are well readable even in bright sunlight with the dark helmet visor down. The HSI provides a graphical representation of the 360 degree rosette overlaid with the ADF needle, the VOR or Tacan modes provide a very readable central deviation indicator together with the bearing display. In addition, the Tacan mode supports a plan position display rendering of the aircraft relative to the beacon and its pattern of radials. For precision IF, the standard 360 degree displays can be switched to an enlarged sector display, which expands the forward 45 degree sector across the whole HSI, vastly improving the resolution of the rosette. The upper MFD is used as an AH with a supplementary compass scale and also provides glideslope bars if selected. DME/Tacan selection provides a readout of absolute velocity to station, which is an accurate groundspeed when heading to/from the station. The PC-9's smooth and precise handling characteristics make for an excellent IF training platform, this is further enhanced by the highly capable EFIS. The RAAF's student pilots will have an unfair advantage over their civilian counterparts in IF training with this level of capability. Entering the circuit, the PCL was set to about 18 psi for 130 KIAS, with the gear lowered at mid downwind. With the gear down the aircraft decelerates rapidly and a slight nose down pitching moment is experienced. Advancing the PCL to 21 psi or so and a slight application of elevator trim appears to be adequate and the aircraft is very easy to hold exactly at the 1,000 ft altitude.The precise handling characteristics are in no way degraded even at this low speed, in a dirty configuration. We flew several circuits, one of which was a goaround due to my inexperience in flying RAAF circuits, ie I rolled out on final past the centreline. The goaround is conventional, with application of full power and the gear retracted once a climb configuration is established. The RAAF's training videotapes emphasise the several seconds of lag in engine response following PCL movement, at low psi settings, but I did not find this to be a serious deficiency in handling as typically underpowered civilian trainers take that amount of time to get moving even if the engine responds instantaneously. PCL setting for base is about 10 psi and will need to be adjusted for the circuit, the aircraft's speed is allowed to slowly wash off on base down to 95 KIAS on finals. The PC-9 is comfortable on finals and the visibility is superb, even over the long nose. The aircraft flares nicely at about 85-90 KIAS and will smoothly sink, without a tendency to balloon as one comes to expect with an aircraft with a sensitive elevator. Due the absence of any significant crosswind there was no opportunity to see how the aircraft sideslips wing down on short final, but given its docile handling this would be unlikely to present any unwelcome surprises. On landing once off the runway, the seats are secured with the master pin, the canopy is left closed until shutdown. Needless to say the G-suit went off very quickly, once out of the aircraft. My RayBans were evenly coated with a foggy film of sweat. The PC-9 is clearly a superlative training aircraft, with excellent handling characteristics and impressive performance. It is however a handful initially for an inexperienced aviator and will without any doubt sort the men from the boys in the first 20 hours of the syllabus. Beyond that point, the PC-9 will bring out the best in any student, and offers much growth before the student its the aircraft's inherent limitations. 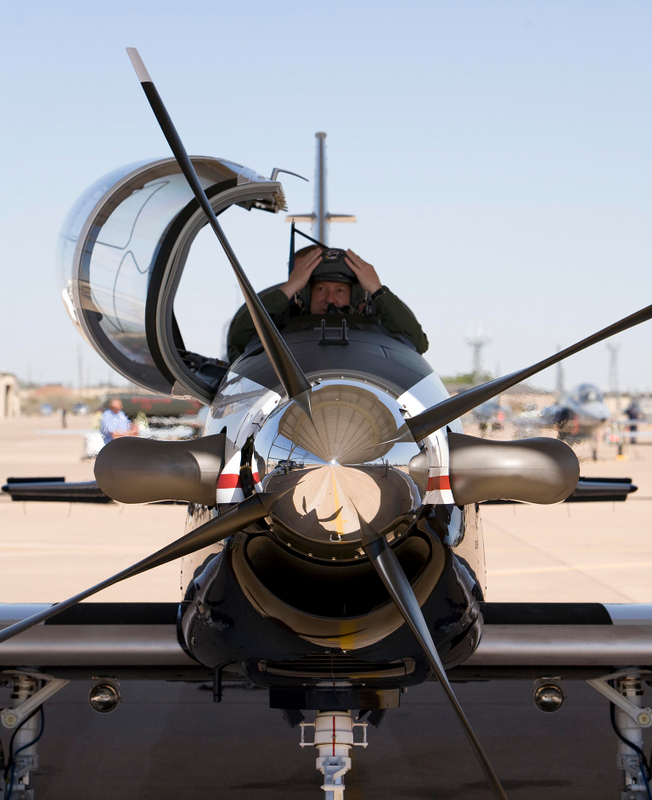 Future tactical pilots will benefit considerably from early exposure to fighter-like handling and performance, and the aircraft will facilitate selection of suitable candidates for follow-on fast jet conversion. And I envy them very, very much. WgCdr Frank Atkins and author at RAAF Laverton (© 1991 - 2010 Carlo Kopp, M645/1000S). Special thanks to Wg Cdr Frank Atkins and Sqn Ldr Greg Smith of HQ RAAF Training Command for their extensive assistance in the preparation of this series of articles. RAAF Pilatus PC-9/A assigned to Central Flying School at RAAF East Sale (© 2009 - 2010 Carlo Kopp, Fuji S5800). 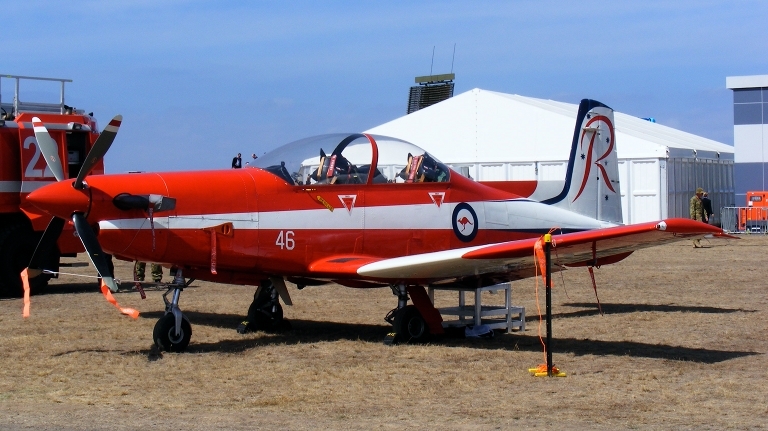 RAAF Pilatus PC-9/A assigned to 2FTS at RAAF Pearce (© 1989 - 2010 Carlo Kopp, M645/1000S). RAAF Pilatus PC-9/A configured for Forward Air Control training (© 2009 - 2010 Carlo Kopp, Fuji S5800). Pilatus Flugzeugwerke AG was founded in late 1939 by Oerlikon, Switzerland's leading arms manufacturer, to manufacture aircraft for the Swiss domestic market, and in particular the air force, the Flugwaffe. At that time, Switzerland was heavily dependent upon imports, particularly in the area of military aircraft. The Flugwaffe's frontline air superiority fighter throughout the war was the Messerschmitt bf 109, initially the Emil and later the Gustav. The German influence was profound, and Pilatus' first military trainer, the P-2 which first flew in 1945, was clearly the product of this. Externally very similar to the Luftwaffe's Arado Ar-96 series, the larger P-2 used the same Argus As411 powerplant as the late model Ar-396, while it used second hand undercarriage and other items from the Flugwaffe's scrapped bf 109 Emils. The P-2 served faithfully through the sixties, but its significance was in that it was the forerunner of a long line of tandem seated military basic and advanced trainers. The P-2 was followed in the early fifties by the smaller and lighter P-3, which was significant in being the first Swiss export in this class, a small batch ending up in Brazil. The P-3 was powered by a 240 HP Lycoming flat six cylinder and was considered underpowered for advanced training. In 1966 this was to be remedied by the PC-3-06, which was fitted with a 550 SHP PT6 turboprop. The PC-3-06 was a sufficiently different aircraft to merit its own designation, and thus the PC-7 was born. The PC-7 is a true basic-to-advanced trainer, with underwing hardpoints for weapon training, tricycle retractable undercarriage, a large bubble canopy and fighter like handling. The dorsal keel surface attests to this, as a remedial measure to cure the flat spin prone PC-3 airframe. Clearly Pilatus had from the outset sought excellent handling, although in the PC-3 this had led to marginal stability under some conditions. In the absence of electronic flight controls, the pursuit of the desirable high instantaneous pitch/roll/yaw rates and low control damping is always a potentially risky proposition and the evolution of the PC-3/7 is a good case study. The PC-7 was a major export success, with many smaller air forces adopting the type for advanced training. By the early eighties it was however clear, that the fifties airframe could be improved upon considerably and Pilatus embarked upon the development of the more capable PC-9. A PC-7 airframe was sacrificed to the cause of development and rebuilt as a technology demonstrator to test key elements of the new design. Flight testing was carried out over the 1982-83 period, and subsequently, in 1984, Pilatus flew the first preproduction/prototype PC-9, HB-HPA. While an evolutionary development of the PC-7, the PC-9 has little structural commonality with its predecessor, it is heavier, much more powerful and has a raised aft instructor's seat for improved visibility. The PC-9 proved to be a winner, and at the time of writing over 140 airframes had been sold to a wide range of nations. 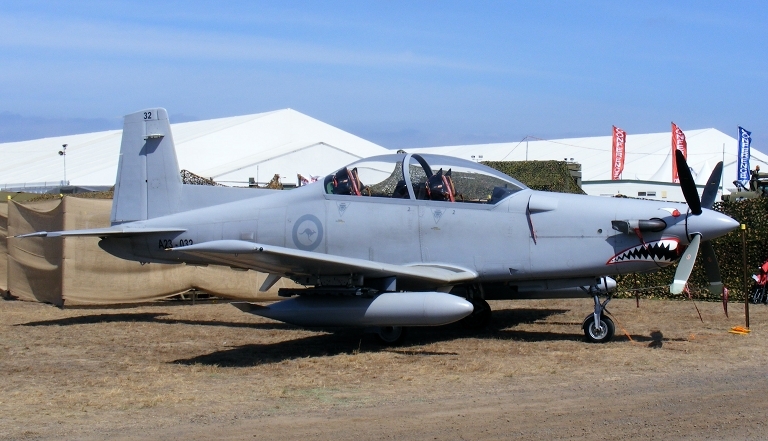 Two notable variants are the Luftwaffe's PC-9B target tug and the RAAF PC-9/A, the Australian aircraft all fitted with the otherwise upmarket optional Bendix EFIS. The loss of the RAF contract to the Shorts-Embraer Tucano was of a political rather than technical nature, the Tucano ultimately requiring very substantial redesign to meet the RAF's requirements. 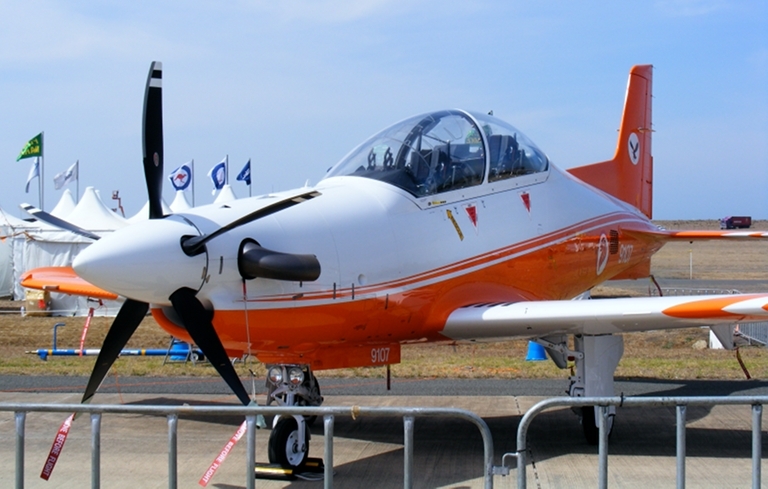 At the time of writing the PC-9 was also a contender in a joint Beech-Pilatus bid for the USAF/USN JPATS (Joint Primary Aircraft Training System) contract. The key to much of the PC-9's superb performance is the 1,150 SHP PT6A-62 turboprop. The -62 is a late model of this very mature powerplant, which employs a three stage axial flow compressor, a single stage high pressure centrifugal flow compressor, feeding a reverse flow combustion chamber which wraps around the turbine stages. The first turbine stage drives the compressors, while the following two stages drive the integral gearbox which transmits power to the prop. The propellor is a Hartzell HC-D4N-ZA/9512A four bladed constant speed unit with an 8 ft diameter. The prop is fully feathering and the engine fuel control and prop pitch control are integrated into a single lever system, using a jet like Power Control Lever. The aircraft fuselage is a semi-monocoque structure, with Aluminium alloy skin and conventional bulkheads and stringers. The tandem cockpits are staggered in height by 6.3" to provide better rear seat visibility, with Martin Baker Mk AU11A ejection seats with fighter style integrated survival kit. The seats are rated down to 60 kt and zero feet. The single piece Perspex canopy hinges to the right and has a central rollbar frame. The nosewheel is aft retracting, with hydraulically actuated steering and split doors. The aft fuselage contains a baggage compartment and structurally supports the tail surfaces. The all metal cantilever tail structure has a conventional mass balanced elevator and rudder, both cable actuated. The PC-9's wing is a conventional cantilever all metal single spar structure with an auxiliary spar, ribs and Aluminium skin. The profile is a Pilatus PIL15M825 at the root, transitioning to a 12M850 at the tip, with a constant chord centresection. The ailerons are pushrod actuated. The flap is of a trailing edge split configuration, extending under the fuselage to a central speedbrake. The flap is hydraulically actuated. The mains are conventional, with oleos and hydraulic disk brakes, RAAF aircraft have low pressure tyres. 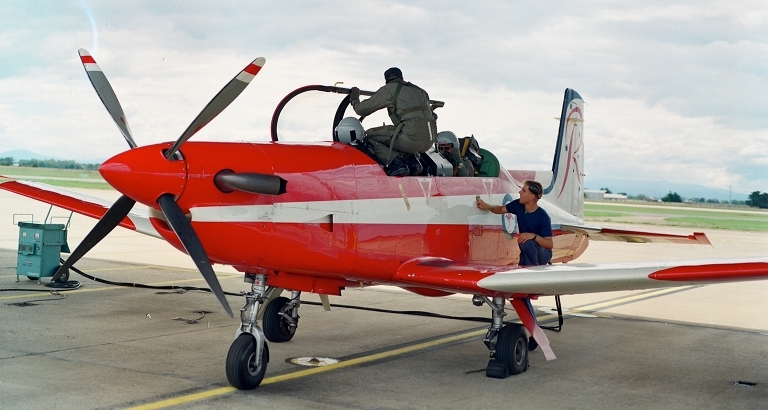 The PC-9 employs an AiResearch environmental control system fed from engine bleed air, for cockpit heating, ventilation and canopy demisting. The 3,000 psi hydraulic system is built by Fairey Systems and actuates in addition to the flaps, also the undercarriage, gear doors, speedbrake and nosewheel steering. Emergency hydraulic pressure is provided by a 3,000 psi fluid/nitrogen reservoir. The fuel system employs two 118 Gal integral leading edge tanks, with overwing refuelling points. A fuselage inverted tank provides for 60 seconds of inverted flight. The 24V electrical system uses a 30V/200A starter/generator and a 40 Ah battery, 115/26V-400Hz AC power busses are driven by a pair of static inverters. Pitot, AoA vane and static ports are electrically deiced. Landing lights are mounted in the mains bays. The PC-9 is a conventional airframe and powerplant design which provides a good blend of handling and performance, approximating very closely the characteristics of the late forties air superiority fighter. This is evident in climb rate, acceleration and turn performance, all of which compare very closely to these classic aircraft. These attributes, combined with the digital EFIS, provide an optimal environment for introducing beginners to the behaviour of a high performance tactical aircraft. 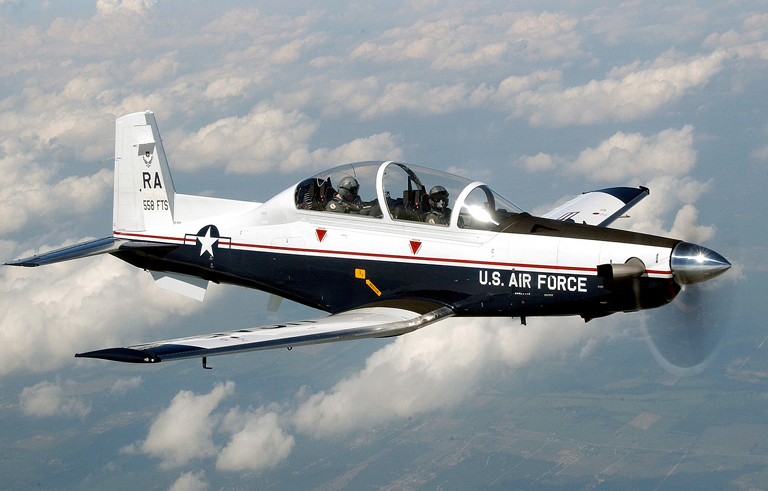 Above, below: the US Air Force T-6A Texan II JPATS is based on the Pilatus PC-9 design (USAF AETC image). RSAF Pilatus PC-21, built as a successor to the PC-9, on display at Avalon in 2009 (© 2009 - 2010 Carlo Kopp, Fuji S5800). RAAF Pilatus PC-9/A assigned to Central Flying School at RAAF East Sale (© 2009 - 2010 Carlo Kopp, Mamiya 645/1000S).